The CMS says it's well on its way to dragging hospital systems into the brave new world of risk-based contracting. The systems say, not really. Though the CMS contends nearly 30% of its reimbursement to hospitals is tied to some level of performance, providers themselves say they are deriving a minuscule amount of their net patient revenue from risk-based contracts rather than fee-for-service medicine. The response to this year's Modern Healthcare Hospital Systems Survey is illustrative. Only 13 hospital systems out of 80 respondents said they derived 10% or more of their net patient revenue in 2015 from risk-based contracts. Two-thirds of the respondents estimated that risk-based contracts generated 1% or zero of their net patient revenue. Hospitals are either not eager to bear downside risk because they are afraid, or they cannot find health plans willing to share the data needed to negotiate contracts perceived as fair to both parties, said Len Nichols, director of the Center for Health Policy Research and Ethics at George Mason University in Fairfax, Va. “Both phenomena are operational across America today,” Nichols said. Moreover, hospitals appear to have good reason to be skittish about taking on risk-based contracts, according to a recent survey of 142 providers by accounting and consulting giant KPMG. The firm found that 52% expected their value-based contracts to lead to a drop in operating profit or surplus. That contrasted with 47% two years ago. Of those expecting some decline in operating profit, 27% expected that drop to be 10% or more, according to the survey. Only 10% of the 142 respondents felt that value-based contracts would produce an improvement in operating profit of more than 10%. Nichols said hospitals are approaching risk-based contracting very cautiously. First, they are just getting back on their feet from the Great Recession of 2007-09. They saw their volumes sink and red ink rise as out-of-work people or those scared of losing jobs put off discretionary procedures, he said. Then, hospitals had to bear the financial brunt of the first few years of the Affordable Care Act as the CMS cut rates as hospitals waited for volumes to slowly rise and for some states to expand Medicaid coverage, he said. Now that they are finally seeing surpluses—average hospital margins reached a 30-year high of 7.3% in 2014—they aren't thrilled about venturing into the uncertainty of risk-based contracting, Nichols said. Risk-based contracts come in a variety of shapes and sizes. The highest form is full capitation, in which hospitals or physician groups receive a monthly payment to provide all care for an enrollee. Lesser-risk contracts include bundled payments for conditions such as joint replacements, Medicare shared-savings contracts and those with provider bonuses or penalties for quality, readmissions and patient satisfaction. New York City-based Montefiore Health System has been moving toward risk-based contracting since 1996, said Stephen Rosenthal, senior vice president of population health management at the system. Montefiore ranks seventh among respondents to the Modern Healthcare hospital survey in percentage of net patient revenue derived from risk-based contracts. Rosenthal said 25% of total revenue comes from those contracts, which encompass 400,000 covered lives, including 220,000 who receive care under full capitation. “Our goal is to get our portfolio on the highest percentage of capitation possible,” he said. Montefiore embraced risk-based contracting in 1996 when national managed-care companies such as Aetna and UnitedHealthcare entered the New York market to compete with the Blues, often by selecting out the healthiest populations to cover, Rosenthal said. 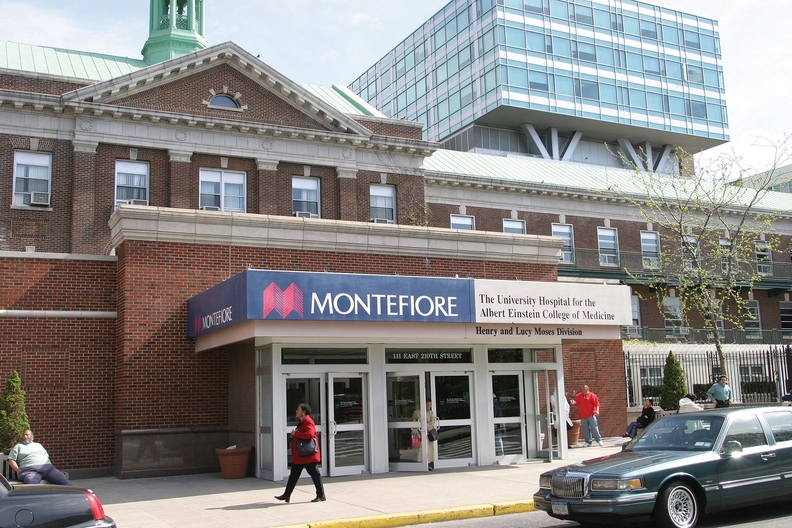 Over the next five years, Montefiore boosted the number of covered lives it contracted on a capitated basis from 50,000 to 150,000 as New York Medicaid moved to managed care and Medicare expanded. So when Montefiore began developing a Pioneer accountable care organization four years ago, the system was already well along in managing chronic diseases and stressing the collection of patient quality and satisfaction data that the government sought, Rosenthal said. One of the big advantages that Montefiore has over some other systems is that it does its own claims processing, so it does not have to rely heavily on insurers for the cost and volume data to price its contracts, though insurers have been very cooperative in providing that, he said. Rosenthal said Montefiore breaks even on its risk contracts when money for management and technology investment are considered. With fee-for-service, the system has a total margin of 1% to 2%, he said. Montefiore, he said, is spending tens of millions of dollars switching its hospitals and doctors to an electronic health record system from Epic Systems Corp., an investment that is expected to help make the entire system more productive. Providence Health & Services, a 34-hospital system based in Renton, Wash., derived 27% of its $14.2 billion in 2015 revenue from risk-based contracts, the company reported to Modern Healthcare. Three of Providence's newest risk-based contracts are directly with employers: Boeing Co., Intel Corp., and Sound Health and Wellness Trust. Modern Healthcare's Hospital Systems Survey reveals most provider organizations are only in the beginning stages of taking on financial risk for managing patient care. Craig Enge, vice president of accountable care services at Providence, said the contracts that began in January 2015 are modified fee-for-service with payments reconciled for meeting quality and other measures. Employees who opt in at the start of each year have access to the ACO that Providence operates in Seattle called the Providence-Swedish Health Alliance. Providence Health Plan has operated for 30 years and has 650,000 enrollees, so the system has managed risk for a long time, said Dr. Rhonda Medows, executive vice president of population health at Providence. That said, some risk-based contracts generate a surplus and some a loss, Enge said. What can't be denied, Medows said, is that more risk is coming to providers. Beginning in 2019, the reforms in the Medicare Access and CHIP Reauthorization Act of 2015 will put physicians at risk for meeting quality and safety metrics the same way the ACA put hospitals at risk, she said. “That's the way we are all moving,” Medows said. A year ago, Providence created a population health division, headed by Medows, to develop the protocols, tools and data analytics to continue the journey of sharing risk with payers, including employers. St. Louis-based Ascension Health, the nation's largest not-for-profit health system, has a similar subsidiary in Nashville that was likewise created about a year ago, said Paul Posey, president of Ascension Risk Services. The unit has assembled 300 employees to help shape Ascension's continuing transition to value-based care—one that really began generations ago as its hospitals sought to manage populations to meet their mission of providing access to the most vulnerable, he said. Nurse navigators are stationed in Nashville, where Ascension has a big presence around its St. Thomas flagship hospital, to help patients get care in the right setting, Posey said. Doctors and Ph.D.s look from a macro level at whether Ascension operations across the country have the right delivery networks and physician incentives. Others crunch data from Ascension's seven health plans, 14 Medicare shared-savings arrangements and numerous hospital partnerships and ACOs to ensure that the 2.6 million lives that Ascension has under value-based arrangements are getting efficient care, Posey said. In its Modern Healthcare survey response, Ascension said 35% of its $20.3 billion in total revenue last year was derived from risk-based contracts. Hospitals will get more comfortable with risk-based contracting when they finally figure out what their real costs of care are per patient episode rather than service delivered, said Dion Sheidy, KPMG's advisory leader for healthcare. That means closely managing care preparation, diagnostics, treatment, post-treatment and pharmaceutical costs to understand the payment they can afford to accept, Sheidy said. That's still a work in progress at most health systems, though. “I think we'll see real traction on risk-based payments within three to five years,” Sheidy said.